This fun and hilarious one day workshop for ages 14-30ish will explore concepts of gender and sexuality with performance artist Sunny Drake. -Focusing on how liberation for LGBTTIQ people is liberation for ALL people. 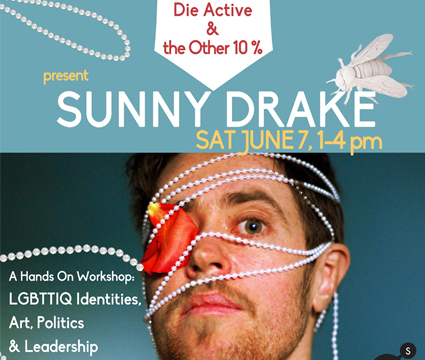 *Sunny Drake produces, creates and tours exceptional multi-disciplinary work by queer and trans artists. He will be sharing and discussing his creative and leadership work with Die Active & The Other 10% in this special one day workshop!